Involved in Tax Fraud? Get in touch with a Sacramento tax attorney! In the Sacramento suburb of Rocklin, CA it seems that there has been a bit of a spike in identity theft, especially in the realm of tax fraud. 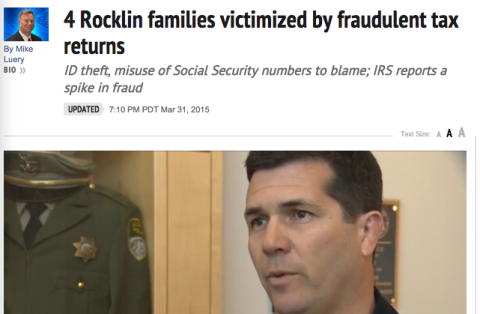 Four different Rocklin families, within a three-mile radius of one another had their identities stolen and their tax returns filed, without their knowledge. One of the families went to file their taxes only to find that they’d already be filed. What a surprise! Knowing a few different ways to keep your personal out of reach of fraudsters could save you a ton of money and hassle in the long run. Here are a few things to consider to keep yourself safe from scammers. Aside from the most obvious suggestions of shredding documents and creating strong passwords, one thing to keep in mind is to not over-share on any of the social networking sites you have. Something as simple as letting a friend know a password to an account or even mentioning which back you go to can give potential thieves enough of a lead to do dome serious damage. Setting you privacy settings to the highest level is also a good idea, so you at least have a good first level of deterrent. It’s a lot easier for thieves to steal a car when the doors are unlocked. Maintaining your computer’s anti-virus software is another protection to take to keep your information safe. Sometimes we allow ourselves to enter into unsecured wifi networks, opening the door to a whole new slough of potential hackery. If you’re going to do any sort of online banking or anything that may expose an opening to you banking accounts, just do it at home. Handling that sort of business at a café or somewhere like that allows an unprecedented amount of access to your files and info. The amount of impact that a hacker or scammer can have on your tax accounts is pretty significant. If your account has been compromised, it’s a good idea to get in touch with a Sacramento tax attorney to help you sort things out and get on the same page with the IRS. Tax lawyers in Sacramento like Tax Tiger have a great track record at helping its clients get on payment plans and even reduce your tax debt. Finding a tax attorney in Sacramento will allow you to know that someone is fighting on you behalf with the knowledge to back it up.